Successfully Added 2 DIN Android 6.0 Media Player - 7 Inch Touch Screen, GPS, 3G Support, Hands Free to your Shopping Cart. The 7 inch 'Destiny' car media Player with GPS and Android 4.4 will enhance you in car entertainment so you'll have plenty to keep you entertained no matter how bad the traffic. The 'Destiny' universal 2 DIN car media player is a practical and easy way to upgrade your car's entertainment and navigation systems allowing you to enjoy all your car journeys. 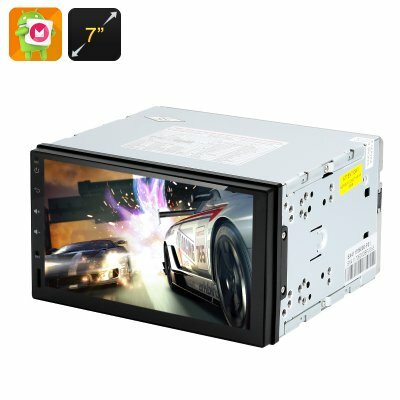 Designed to fit into 2 DIN dashboard slots this universal car stereo is suitable for most motor vehicles and has a large 7 inch screen on which to view your media and GPS navigation features. With an Android operating system you can take control with voice commands using the OK Google features. Simple voice commands allow you to plot routes, get weather reports and play media all without having to take your hands off the wheel. The 'Destiny' in car entertainment system has support for 3G dongles allowing you to get cellular data connections on the go. When it comes to navigation the 'Destiny' 2 DIN car stereo could hardly be easier to use. Load maps to the GPS unit via a micro SD card and with the SIRF III receiver module, Android 4.2 Map support and 3D type interface you will enjoy real-time navigation able to track your every move and guide you smoothly to your destination. Having Android on the 'Destiny' car stereo ensure that there's always plenty to watch and keep your passengers entertained with media fun. AM and FM radio frequencies add to the entertainment by letting you tune into a world of channels so not matter how long the queues this Android car entertainment system has plenty to pass the time in style. Bluetooth connectivity on the 'Destiny' offers hands-free controls when paired with your Smartphone, so you can answer and dial numbers as well as stream music, sync your phone and even check your call records. Bringing in 180 watts of speaker support, GPS radio and voice controls this in car entertainment is the smarter way to enjoy your journeys. The 'Destiny' Android 6.0 car media player comes with a 12 months warranty, brought to you by the leader in electronic devices as well as wholesale Car Media and DVD Players. This model is compatible with most brands of GPS software ­ however hardware specific software such as Garmin may not run on this unit. As the wholesaler, we provide the GPS- enabled hardware only, not the software. We provide no warranty or customer support regarding GPS software. We cannot provide downloads, links, advice regarding GPS software. Any software installation you undertake should be performed or supervised by a professional.